Edmund Riding To Bury St. Edmunds, In John Lydgate's 'Lives of St. Edmund and St. Fremund', etc. 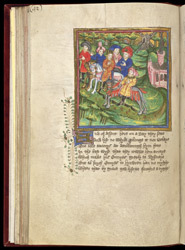 bl.uk > Online Gallery Home	> Online exhibitions	> Illuminated manuscripts	> Edmund Riding To Bury St. Edmunds, In John Lydgate's 'Lives of St. Edmund and St. Fremund', etc. Bury St. Edmunds was the burial place of St. Edmund, a Saxon King of East Anglia, martyred in 869 by Viking invaders who had also martyred St. Fremund in 866. John Lydgate (probably from Lidgate, about 10 miles south-west of Bury), a monk of the abbey of Bury St. Edmunds and one of the most prolific writers of Middle English, translated this work from Latin into English. Having come to England from his home in Saxony, Edmund stayed at Attleborough until called for his coronation: this image shows him and other nobles riding from Attleborough to Bury. The legend that Edmund came from Saxony in Germany is a late medieval mistake: earlier accounts say that he was 'Saxon', i.e. an Anglo-Saxon.